KB offers 47 models of off the shelf distributor style Variable Speed DC Drives that cover the most popular voltages and horsepower ranges. From 115/208-230 input voltages and extending from 1/100 to 5 Variable Speed DC Drives Chassis and DC Motor Controlshorsepower, our DC drives are available as imbedded chassis/IP20, stand-alone Stamped Aluminum enclosures NEMA-1/IP40 and heavy duty, indoor/outdoor, wash-down die Cast Aluminum enclosures NEMA-4X/IP65. A variety of optional DC Drive accessories are also available to meet the most demanding applications. 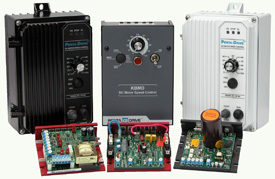 KB Penta Power Variable Speed DC Drives are available through over 800 distributors worldwide. The KBIC Series of DC Drives consist of 10 OEM & 6 Distributor models ranging from 1/100 thru 3.0 horsepower. These DC motor speed controls were first introduced in 1979 and are still one of the most reliable basic DC drives used in thousands of applications around the world. Now manufactured with SMT. The KBMM Series of DC Drives consist of 3 OEM & 3 Distributor models ranging from 1/100 thru 3.0 horsepower. These DC motor speed controls were introduced in 1985 as the ultimate in reliability and performance. Because of its reliability and performance characteristics, distributors around the world have standardized on the KBMM. Now manufactured with SMT. The KBCC-240D chassis SCR speed control provides the same electrical features as the KBPC enclosed control. These include jumper selectable voltage adjust, current rating and feedback type, along with adjustable jog, speed/torque mode and three wire start stop. The KBCC Series of chassis SCR controls consist of two models rated from 1/100 thru 3 HP. Each model consists of a KBMM chassis speed control mounted to a 7" Heatsink assembly and coupled to the Barrier Terminal Kit. The KBCC-R Series of chassis SCR controls are similar to the KBCC Series, but with the addition of an Anti-Plug Reversing Module. They provide variable speed motor control, along with relay reversing, electronic dynamic braking and an anti-plugging circuit which helps prevent motor demagnetization. Properly applied, these controls can be cycled up to 30 times per minute. The KBMD, also known as our "Multi-Drive," can be used with motors from 1/100 thru 2 horsepower and is housed in a NEMA-1 Aluminum enclosure. The heart of this DC Drive is the KBMM. A unique feature of the KBMD allows it to operate a 90 VDC motor from either 115 or 230 VAC making it universally acceptable. The KBWM Series of NEMA-1 aluminum enclosed DC Drives is available in 2 models from 1/100 thru ¾ horsepower. The driving force behind these models is our most reliable SCR control, the KBMM. Its horsepower range is only limited by its physical size, however, it still provides all of the flexibility of our KBMD, Multi-Drive. The KBMG Series of four-quadrant regenerative DC Drives consists of 2 models range from 1/50 thru 2.0 horsepower. These, ultra-compact, chassis/IP-20 style drives are ideal for OEMs. For applications requiring repetitive reversing with regenerative braking the KBMG Drives offer excellent repeatability and reliability. The KBPB Series of SCR DC Drives range from 1/100 thru 3.0 horsepower. These, compact, chassis style drives are ideal for applications requiring occasional reversing with solid-state dynamic braking. The KBPB Drives have been in service since 1985. They offer excellent repeatability and reliability. The KBRG Series of four-quadrant regenerative DC Drives range from 1/10 thru 5.0 horsepower. These chassis style drives are ideal for OEM applications requiring repetitive reversing with regenerative braking. The KBRG Drives offer excellent repeatability and reliability. The KBPC Series of SCR DC Drives consist of 2 models ranging from 1/50 thru 3.0 horsepower, housed in heavy duty NEMA-4X (IP-65) die cast aluminum, washdown / watertight enclosures for indoor or outdoor use. These analog style DC Drives do not require programming. Jumper selectable functions and simple trimpot adjustments make the KBPC Series quick and easy to use. The KBRC Series of four-quadrant regenerative DC Drives consists of 2 models ranging from 1/10 thru 2.0 horsepower, housed in heavy duty NEMA-4X (IP-65) die cast aluminum washdown / watertight enclosures for indoor or outdoor use. Ideal for OEM applications requiring repetitive reversing with regenerative braking. The KBRC Drives offer excellent repeatability and reliability. The KBPW Series of PWM DC Drives consist of 2 models ranging from 1/50 thru 1.5 horsepower, housed in heavy duty NEMA-4X (IP-65) die cast aluminum, washdown / watertight enclosure for indoor or outdoor use. These analog style PWM DC Drives do not require programming. Jumper selectable functions and simple trimpot adjustments make the KBPW Series quick and easy to use. The KBPI Series of SCR DC Drives consist of 2 models ranging from 1/6 thru 2.0 horsepower, housed in heavy duty NEMA-4X (IP-65) die cast aluminum washdown / watertight enclosures for indoor or outdoor use. These analog style DC Drives are ideal for indexing applications. KBPI Drives have been in service since 1990. They offer excellent repeatability and reliability All adjustments are factory set and do not require programming. Jumper selectable functions and simple trimpot adjustments make the KBPI Series quick and easy to use.